Aegina is a beautiful island located in the Saronic Gulf, really close to Athens. Aegina is linked with Athens and Piraeus with frequent ferry schedules, either with highspeed or regular ferries. The ferry tickets to Aegina are quite cheap and the daily ferry itineraries between Piraeus and Aegina are quite frequent, especially during high season. The ferry trip duration between Piraeus and Aegina is 40 mins with flying dolphins or 1 hour and 10 minutes with regular ferries. The ferry companies that operate on this route are Saronic Ferries, Hellenic Seaways, ANES Ferries and Aegean Flying Dolphins. These are the main reasons that Aegina is one of the favorite islands of Athens citizens for weekend excursions during summer. If you plan to travel to Aegina during these months, take care of booking your stay and your ferry tickets (especially car tickets) in advance! Aegina is also connected to Agistri, Poros, and Methana. The connections between Aegina and Agistri are really frequent, with several ferries per day. The route between Aegina, Poros and Methana is served by one ferry per day. For more updated info and details on the prices, you may search in our booking engine. Aegina is a beautiful island in the Saronic Gulf. The city of Aegina is the capital of the island and is located on the west side. It's amphitheatrical position, provides a great view from various spots around the city. In Aegina, one may find many beaches with turquoise waters that meet the expectations of all different visitor categories. Agia Marina, Aegina, Marathon, Partridge, the Bay, the Abbey, are some of the island's beaches. Not to miss: You should definitely pay a visit to the temple of the ancient goddess Athina, stroll around the beautiful alleys of the old city and enjoy coffee and lunch near the port! Enjoy the great views from various spots around the city (because Aegina has an amphitheatrical position it is possible to have great views from almost everywhere of the city). Visit the stunning and ancient Temple of Aphaea that is part of the equilateral holy triangle of temples together with the Parthenon (in Athens) and the Temple of Poseidon (at Sounion). See and swim at the amazing beaches with turquoise waters, like the beaches Agia Marina, Aegina, Marathon, Partridge, the Bay and the Abbey that go beyond the expectations. Visit the impressive church and monastery of Saint Nektarios of Aegina. Stroll around the beautiful alleys of the old city and enjoy coffee and lunch near the port. Island hopping at the Saronic Gulf! Poros, Spetses and Hydra are some of the choices. For more ideas you can check our Ferry Map. 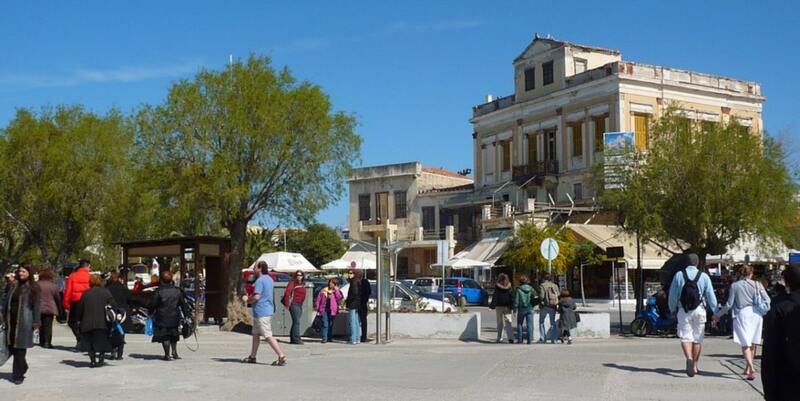 Aegina is one of our favorite day trips from Athens. You can read here more information about this ferry route.